I've got a mouthwatering appetizer to share today...Italian Chicken Sausage Stuffed Mushrooms. These little guys would be a great addition to your game day menu or to serve along side a pasta dish. The inspiration for this recipe came from a restaurant I love and have visited several times during my trips to NYC, Carmine's. They have several locations in NYC as well as Atlantic City and a newly opened location in Vegas. They specialize in family style Italian dining. During one of my visits, I was fortunate enough to get my hands on an autographed copy of their cookbook. 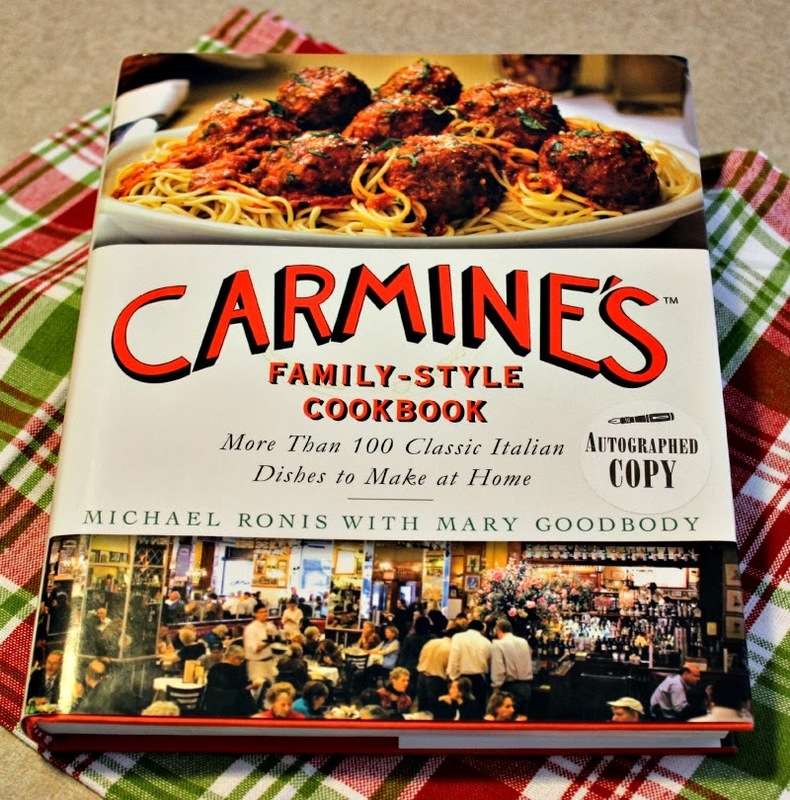 It's from this cookbook that the Italian Chicken Sausage Stuffed Mushroom recipe was adapted. I have had the pleasure of enjoying Carmine's Sausage -Stuffed Mushrooms while dining there, and let me tell you...perfection. I was eager to find a way to enjoy these at home and was glad the recipe for the original was in this book. The secret to the flavor explosion in these stuffed mushrooms is the Mild Whole Sweet Piquante Peppers (Peppadew peppers). Just a small amount of these peppers imparts amazing flavor for very little calories! 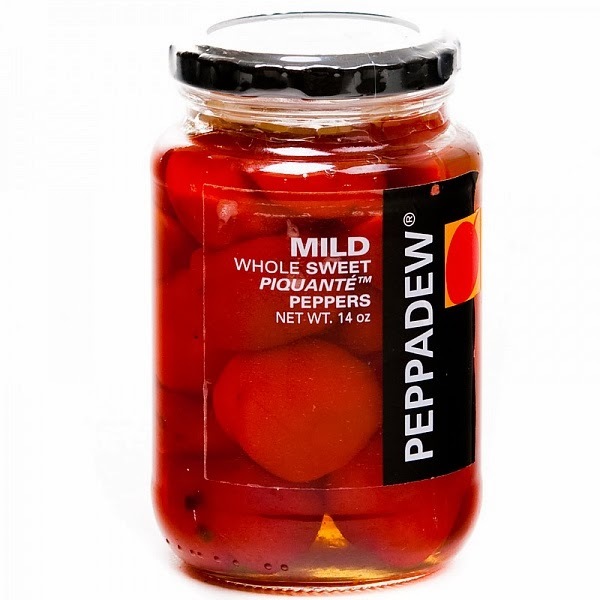 If you can't find these peppers, any vinegar-ed sweet pepper will do. Since the original recipe calls for "Carmine's bread crumbs" (which are seasoned and flavored bread crumbs) in the filling, I decided to substitute cracker crumbs for them in my version. You can use any type of cracker you like here. Saltines, buttery crackers, and garlic flavored crackers all work well. You can choose to use fresh HOT Italian Chicken Sausage or the MILD version, depending on how spicy you like things. If you can't find Italian Chicken Sausage, you can substitute fresh turkey sausage instead. These stuffed mushrooms can be made ahead of time, up until the baking, and stored in the fridge until you are ready to bake and serve them. I'd say that makes them pretty perfect for the Big Game! Clean the mushrooms and remove the stems. Finely chop the stems. ( I used my mini food processor). Set aside. In a 10" cast iron skillet or in a 8x8" baking dish, lay the mushroom caps with stem side up. Set aside. Add to the skillet, the green peppers, chopped mushroom stems, and the garlic. Cook for another 8 -10 minutes or until the peppers are soft and the liquid from the mushroom stems has evaporated. Add in the cracker crumbs and enough chicken stock to moisten. (you may or may not use all the stock) Turn off heat and add in the Parmesan cheese and the piqcante peppers. Stir. Allow to cool to lukewarm. Stuff mushroom caps with about 1 - 1 1/2 TBS of sausage mixture. At this point, you can either refrigerate the mushrooms and filling and bake later OR preheat the oven to 400 degrees F.
Bake the mushrooms for 15-20 minutes or until the mushrooms are tender. Serve warm from oven. These mushrooms are definitely a flavor explosion when you use the HOT sausage and the piqcante peppers. Wow. While they are not exactly like the original, they are a tasty substitution. They are a pretty good deal calorie wise too! Ugh...I am so completely over winter. Another cold blast. More snow. I am dreaming about spring to help get me through! lol How about you? I know my California friends are begging for cooler temps..but us here in the Eastern half of the country, are dealing with an awful lot of severe winter! 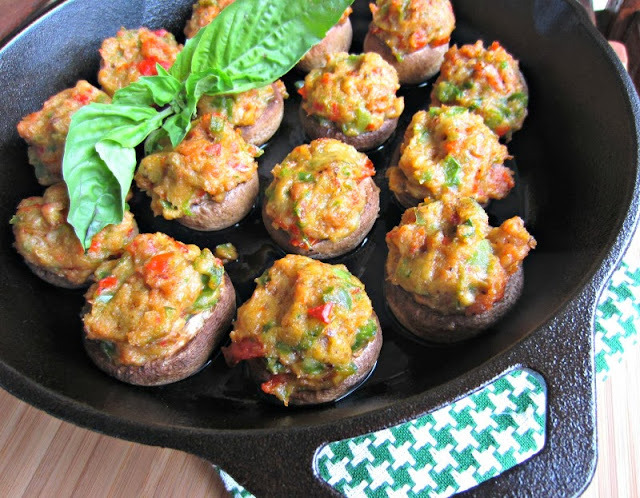 These stuffed mushrooms look amazing, and I love that you used chicken sausage! I am looking forward to trying these! I'd love if you would drop by my Super Bowl Eats and Treats Linky Party, and share your recipe! You can link up any crafts, appetizers, sandwiches, desserts, anything that says "Super Bowl" to you! We would love to have you! thanks for stopping by and I'd love to share these with your linky party! What a yummy recipe. Always use chicken sausage, so tasty with less fat. Thanks for sharing! Thanks for stopping by. They really are quite tasty and you can't beat the calories! These sound delicious. 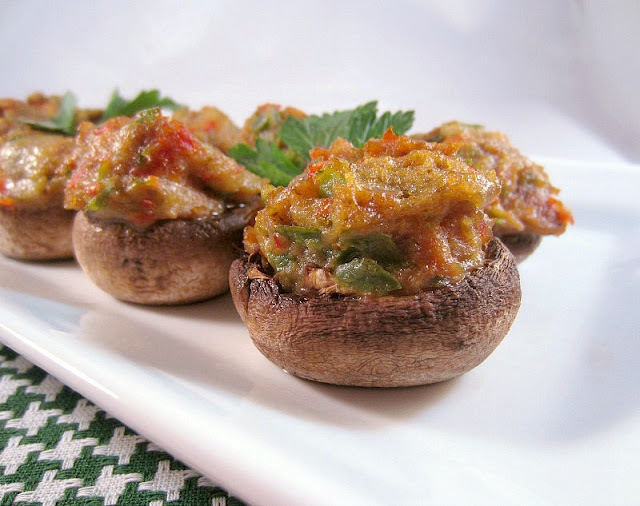 I love stuffed mushrooms of just about any kind so I will definitely be planning to make these. Thanks for stopping by! I love stuffed mushrooms too! Oh my. Definitely pinning these. These would be great for a Super Bowl party! Yes, they would be perfect for the big game coming up!!! thanks for pinning! Me too! Thanks for stopping by and pinning! These look delicious Renee! We love stuffed mushrooms here!